Kidney Month is observed during March – a month dedicated to the awareness, prevention and treatment of kidney disease. The kidneys are two bean shaped organs, about the size of a fist, located just below the rib cage. Every day, they together filter about 200 quarts of blood to remove waste and extra fluid from the body. This waste is then removed from the body through urine. The kidneys play an important role in the overall health of our bodies. In addition to removing waste and fluid, they help to control blood pressure by controlling fluid levels and making renin, a hormone that regulates blood pressure. They control acid levels, produce erythropoietin, a hormone that enables bone marrow to make red blood cells, and make active Vitamin D, which absorbs calcium and phosphorus for strong bones. Cross section view of a human kidney. The kidney is filled with nephrons that filter blood and generate urine. If kidneys are damaged, they are not able to do these important jobs. Waste can build up in the body and symptoms such as ankle and feet swelling, vomiting, weakness, itchiness, sleep problems and shortness of breath can develop. Bones become weak and brittle and it can be difficult to concentrate. If kidneys are severely damaged, kidney failure can become a threat and dialysis or organ transplant are the only options. But many who have kidney disease, known as Chronic Kidney Disease or CKD, don’t even know it; it can start slowly and develop very gradually, so symptoms sometimes don’t appear until the later stages. It therefore helps to know the risk factors and understand habits for good kidney health. At higher risk for CKD are those with diabetes, high blood pressure and a family history of kidney disease. People of Aboriginal, Asian, African/Caribbean and Hispanic descent, as well as anyone over the age of 50 years old, tend to be higher risk. Those who smoke or are obese are also at risk. Testing for CKD is relatively easy. A blood test or urine test will give doctors the information they need to determine if you have CKD. Fortunately for those without the typical risk factors, kidneys are adaptable and able to make up for loss of function. And nutrition can play a major role in kidney health. The key is proper balance of important nutrients. Water is essential for the kidneys, because it helps them to remove waste from the body and opens up blood vessels to allow blood to travel freely. It is important to not get dehydrated. Too much sodium in the body can damage the kidneys, so foods high in sodium, such as deli meats, canned and prepared foods, fast foods and some seasonings should be limited. Protein is important to fight infection, but too much protein produces too much urea, a waste that can build up if the kidneys can’t eliminate it properly. Minerals such as potassium and phosphorus are important but must be kept in check and possibly limited. Potassium helps regulate heart rate and aids muscle health, but if kidneys are not functioning properly, high potassium levels can affect heart rate and possibly cause a heart attack. High potassium foods include potatoes, bananas, squash, legumes, dairy and peanut butter. Phosphorus keeps bones strong and healthy, but poorly functioning kidneys can’t remove it from the body and too much phosphorus can cause bone weakness and calcium deposits. Phosphorus is found in dairy, protein foods, seeds and nuts and processed foods. Someone with reduced kidney function might consider taking Vitamins B, C and D, iron and calcium supplements to aid with kidney function, however it is important to take supplements only under the advice of a doctor. 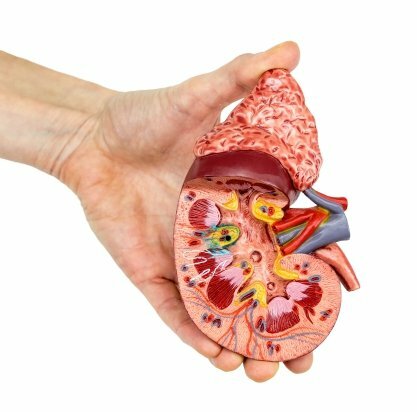 The kidneys are not something that people think about, but a better understanding of our kidneys and how they work can go a long way. This month, take time to consider your kidneys – you would miss them if they were gone.